Luna is a high-powered performance synth that combines powerful analogue sounds with custom digital flexibility. Optimised in over 100 custom-built patches combining unique FX units, signal-flow and a modulation matrix, the synth is ideal for keyboard wizardry, studio-trickery or sonic exploration. 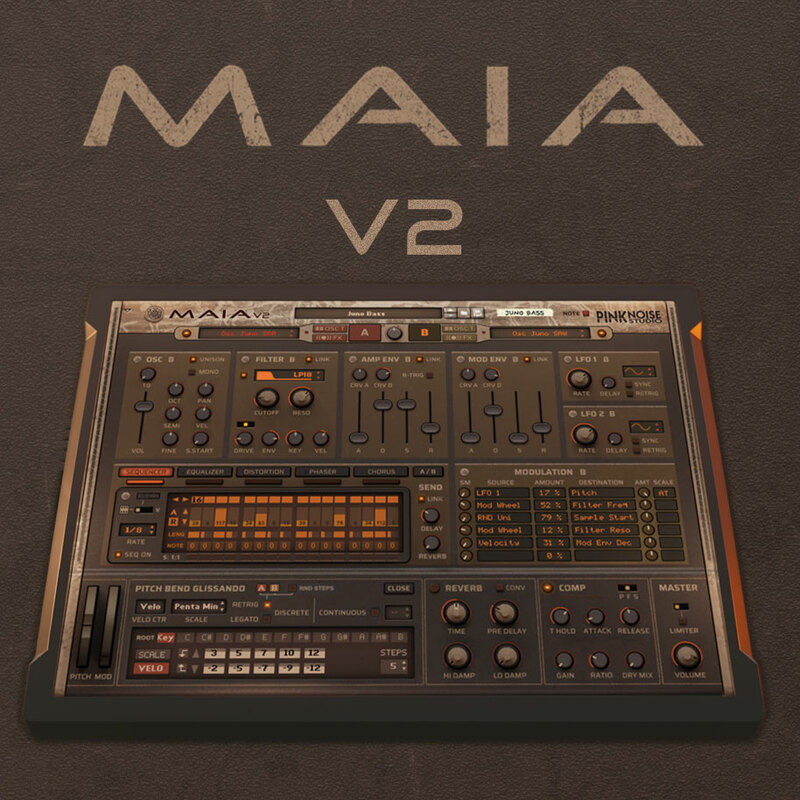 Maia is a synthesizer full of soul. It can be an emotional instrument or a furious beast, depending on your mood. BIG BUNDLE (2019) is a special release, all current refills of PinkNoise Studio are included in this 'economical' package. Analog Night is a sound collection based on the best sounds of Yamaha AN1x synth. It was originally released by Eric Corminier (Reason.Fan) for REASON 1.0 in 2002. The original release provided support for the NN-19 sampler only. This new 'second edition' contains the same massive 1.2 GB multi-samples, but in addition to the original 1010 NN-19 Patches it gives you 350 new optimized patches for the NN-XT advanced sampler. Analogue Monsters is the most comprehensive and ultimate collection of real analogue instruments. The refill is based on 5 GB samples from 10 famous synthesizers. The keyword of Analogue Monsters is 'authentic analogue sounds'. Cybervox is a voice refill and toolkit for creating wide range of artificial or humanoid voice type sounds in REASON. It offers formant shaping, advanced vocoding and realtime sound manipulating techniques for live performance. Cybervox is a unique refill, completely different from any of our previous products. Are you ready for a dive? Warm analogue strings, ambient textures, atmospheric pads, fat synth sounds - this is Deepflight. DeepFlight is based on 1GB sound samples of the famous Roland D-50 synth from the late 80's. EPIK4 is a synth refill based on the sounds of KAWAI K4 synthesizer. The sister of Deepflight gives you the sounds of the 90s with a modern twist! This library is the essence of 14 years of experience. ESSENCE is 100% compatible with both Reason Essential and Reason. ESSENCE is based on 2.2 GB sound samples. Our aim was to create a general purpose library that is useful for anyone, whether they are beginners or professional musicians. Europa Retro Waves is a wavetable expansion for the Propellerhead Europa synthesizer, focusing on the wavetable capabilities of Europa and featuring a wide range of vintage synth and wavetable sounds from the last century. The package contains 100 meticulously selected wave samples, optimized specifically for the Europa synthesizer. The keyboard loop player 1 is a loop based arpeggiator and sequence player for Reason 4 or higher. KLP enables you to play melodic loops on your midi keyboard in a very easy and creative way: you can play bass, arp and other rhythmic sequences in Reason while you will feel exactly as if you were playing on the original synthesizers. The keyboard loop player 2 is a loop based melodic arpeggiator & bass sequence player for Reason 6. KLP enables you to play melodic loops on your midi keyboard in a very easy and creative way. We have improved the original concept, and thanks to the advanced features of Dr.Octo Rex, now you can switch among these loops while you're playing. MATRIX refill puts an Oberheim Matrix-1000 synthesizer into your reason rack. Featuring a wide range of warm analogue sounds, this collection lets you add dynamic basses, fat leads and vivid pads to your musical productions. ORANGE4 is a wavetable synth refill, based on the sounds of the famous Waldorf MicroWave Xtk synthesizer. It combines two methods: the maximal utilization of Reason's internal samplers and the fat sound of the original instrument. PROTON v3 gives you a wide range of rich analogue sounds and a unique combination of power and flexibility extensively using the specific features of Combinator and NN-XT advanced sampler. Moreover PROTON v3 integrates 2 hardware based chorus effects into Reason. proVITAMIN MKII refill puts a premium quality GM synthesizer into your Reason rack. Soundfont edition of proVITAMIN is also included. This refill was originally released by Eric Corminier (Reason.Fan) for REASON 1.0. It provided support for the NN-19 sampler only. This new 'second edition' contains the same massive 1.1 GB multi-samples as the first release, but in addition to the original 680 NN-19 Patches it gives you 300 new optimized patches for the NN-XT advanced sampler. QuickSilver was originally released in 2003 (our 3rd refill), and it was one of our most successful product. QuickSilver is based on the sounds of the Yamaha QS300 synthesizer. REVOLVER is an analogue synth refill, based on the sounds of DSI Evolver synthesizer. In other words, it can be viewed as a continuation of the Analogue Monsters series: REVOLVER provides vivid, dynamic and rich-sounding real analogue sounds, giving you a powerful new synth in your Reason rack. Sonic-O-Tool - if you remember this name, you might be a Reason-veteran. This product was our very first commercial refill and it was originally developed to Reason 1 in 2002. The refill contains 314 NN19 presets and 15 redrum drum kits, based on 2000 wav samples. VIROLOGY refill is a sound library based on the sounds of the famous Access Indigo2 (Virus C) synthesizer, and gives you a wide collection of vivid and powerful sounds. VIROLOGY - like a rompler sound module - can provide both the original Virus sounds and entirely new electronic sounds!